We often find patients assume they will not be suitable for implants for a range of reasons including the extent of reconstruction required. However, the truth is any normal, healthy adult is suitable for dental implants. 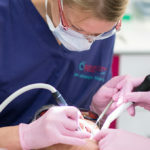 Dr Eilert Eilertsen has placed thousands of implants and is experienced in finding solutions in the most challenging of cases, while Dr Jenifer Eilertsen also brings the most up to date knowledge and techniques from the Royal College in London. 2. Medical problems with your bone. 3. Infection in your gums. This is not an absolute no but it is not advisable. It impairs the healing and thus we do everything to try and persuade you to stop smoking to try and give the healing process the best chance. Even if you aren’t suitable for implant you can be sure there will be a solution for you so don’t let concerns like these put you off booking your free consultation.